My First Surgery – Do I Look Sick? I woke up at 5:00 (am) and was pretty wide awake. The night before I had stayed up late IMing friends online and texting people asking desperately for comfort. I had never had surgery before and I was terrified. My best friend from high school asked me to call before I went in. I was expecting to leave a voicemail, but he answered at 5 in the morning. He said he was up studying – that’s so like him. I wrote that it was nice to talk to him, but I wish I’d written what he said to me. I can only barely remember it now. I was in my bedroom at my parents house, I remember my heart beating a mile a minute, and I know he told me something like that everything would be okay. When we got to the hospital I was a little jittery but ok. They had me change into a hospital robe, but they let me keep on my purple knee-high socks. That made me feel much, much better. In fact, I had asked long before the surgery if I might wear knee socks, and spent a lot of time picking out a pair that would make me feel most like myself. I chose purple and black argyle. They made me lay down on a hospital bed to wheel me to the prep room. It felt so odd, why didn’t I just walk there and lay down myself? There were no IVs or meds yet. Do they think this is more relaxing? Because it isn’t! My parents and my then fiancé were walking just behind my head, and I was pretty distressed that I couldn’t see them. They had to leave me at some point, and I continued on alone, pushed by an unseen force through doors that opened themselves. It felt like Haunted Mansion, and I decided to pretend like it was a ride and feel excited…as best as I could. Almost as hard as pretending the ACTUAL Haunted Mansion is fun and not horrifying. They wheeled me into a room of busy nursing staff and I felt weird, like a coffee table, because nobody acknowledged me lying there for a while. Then my anesthesiologist came and talked to me, and he’s stupid for not calling me the night before but whatever. Oh my gosh, I can’t believe I forgot this! Yes, I am terrified of needles, and I had never had an IV before. When I told my doctor how frantically terrified I felt at the whole prospect, he said that the anesthesiologist would call the night before and if I told him that, he’d prepare a pill for me to take to help me calm down. BUT NOOOO. He just said “You’ll be okay.” and told me he’d numb it up before he put it in. I thought that sounded pretty good, but then he whipped out a needle. WTF ARE YOU KIDDING ME? I’m a patient who’s terrified of needles, so to ease my fears you will numb the injection site….WITH A NEEDLE?! And with that, I burst into tears. I let out a small cry, like a puppy does when you accidentally step on it. Then I sobbed and sobbed and sobbed. But I sat very still. He looked like a guy defusing a bomb, sure I would jerk away and kick him in the face at any moment. But I didn’t. I know I have to behave. But I was so scared and so uncomforted by this man I can hardly remember now. If you ask me, every single anesthesiologist should have the demeanor of Santa Clause or a Disney World employee. Anyway. After he stuck me with the numbing stuff that is NOT calming at all, I pulled the sheets over my head. I let my arm dangle out, but I was not going to look at him any more. Probably why I can’t really remember him. I just cried in my own little sheet world while he stuck an IV in me. It made my arm cold. Boo. I guess at some point I was coaxed into not sitting under the covers like an angry five year old, because I do remember these ladies, whom I loved…and kind of hated. Two nurses worked with me after that. One was blonde and German, and she reminded me of Ula from the Producers. She said “See? We aren’t ze most terrible thing in ze world now are vee?” The other was a warm, motherly type nurse. (She was also there for my second surgery, and she even remembered me.) They were nice, so I liked them…until they started telling me a plethora of things I did not want to know. They said it’s normal for one’s throat to be a little sore after the operation – why? Because they’re going to stick a tube down i–WHAT!? They’re doing what? Oh my G– and after the operation you may feel like you really need to pee – which is panic inducing in and of itself if you know the story of my diagnosis – why? Because they’re going to stick a tube up–OH MY GOD, WHAT?! WHAT?! NEVER MIND, FORGET IT, I’M GOING HOME. I can see why my doctor didn’t mention these things. WHY ON EARTH WOULD A NURSE MENTION THEM?! I am strapped down to a gurney, totally helpless, and now is the time you decide to bestow these little gems on me. I woke up in the room I started in. I can hardly remember what happened, but I do remember them telling me a little about the operation, asking me questions like what my name was and how I felt. I know they told me a little about how I need to eat and walk and pee before I was allowed to go home. What I remember most was them saying I could go see my Mommy now. As I was wheeled to my room, I started to cry a little. I wanted to start yelling for my parents and my fiancé. We turned the corner and my husband was peeking out of my room. Shortly after I got settled, I started feeling a lot of pain, so I got some morphine and a pill. I napped on and off while Mom and Dad watched Deadliest Catch. I ate ice chips like a pro, but soda, juice, and crackers were all quite unappetizing, and it took forever for me to eat something. I could hardly stay awake, and when I was awake I felt awful. I dreamed things, and talked in and out of sleep. Toby was sweet and responded kindly to whatever random things I said about making gloves for his costume or buying a new car. We stayed at the hospital a lot longer than I thought. When it was time for me to walk by myself, there was much crying. I was in so much pain. Blood was coming up in my IV, which was pretty distressing. My dad put his arm over it in an attempt to not let me notice while he helped me up. The incision hurt, but what was worse was the pockets of air they had pumped into my body for the surgery. I still cringe when I think about it – that is truly the worst feeling, and the worst kind of pain. Once I was on my feet, I asked a nurse if it was okay if I threw up. She handed me a barf bag. But she didn’t understand, I needed to know it was okay, I needed permission! I didn’t want to throw up any crucial medicine, or– too late. Forgive me if this is TMI, but I have never thrown up like that before. It was projectile – luckily aimed at the bag – and it filled up aaaaaall the way to the top. I was somewhat embarrassed to have thrown up in front of my husband to be, but it was hard to dwell on it. I instantly felt so, SO much better. I was all smiles. Husband still laughs when he recalls that moment. He always says it’s amazing how instantly happy it made me – I could not stop smiling. That’s how much of a relief it was. So as they wheeled me out, I was smiling. I held my pig that Husband won me at the state fair, and every nurse we passed told me how cute it was. There was a choir singing carols in the lobby, and I felt so happy to be going home. I also had a balloon with feet from my mom! I’ve always wanted a balloon with feet. I was feeling pretty crumby when I got home. 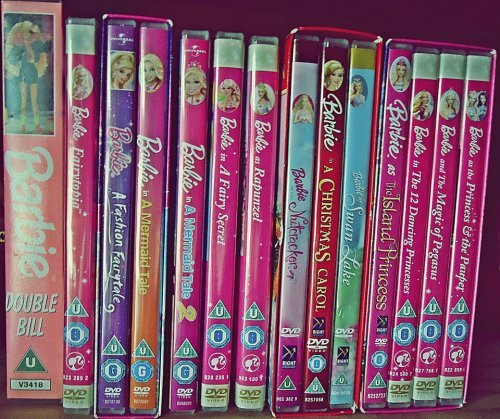 I got to pick all the movies – we started with Sweeney Todd, then watched all the Barbie movies. Husband had bought me 5 or 6 of them in preparation for this surgery. We discovered in the months leading up to my surgery that vicodin-Rachel looooooves her some Barbie movies. Weird, because when I was a little girl I wasn’t particularly fond of her. Vicodin Rachel is set for life! Husband’s mom came and visited, and she brought me a beautiful gift set of assorted hot teas, AND real raw sugar. I’m a happy girl, but I miss my boy. Husband’s performing in his play tonight, but he’s wearing a yellow ribbon for me. I’m going to write an entire entry about this soon, but yes, my husband wore a yellow ribbon for endo awareness during a live performance of his first professional acting job. Pretty much doesn’t get more supportive or romantic than that. I’ve been told bits and pieces about the surgery and where we’ll go from here, but I’ve been out of it. I have a follow-up appointment on Friday, and I’ll keep you all posted. What I can tell you for sure is that he zapped my endometriosis out, and things are going to start getting better now. Ah, I sound so sure. Things did get a lot better for a long time, but it wasn’t a forever fix. She said that reminds her of Psyduck. I literally think of that every single time I look at my stomach. The “eyes” faded away over time, but that big psyduck mouth will be there forever. I’m with you on the second time being easier! First time was scary, but the second time I could prepare myself and my mind much better knowing what to expect. Little things like knowing what the pain was going to feel like, and the odd sensation of your body thinking that pain is in your shoulders because of the gas used. I also did little things like washing my hair the night before, getting everything I needed as waist level or higher. That’s so funny, because the first time I was in pain and weak for a much longer time, but the second time I DID get an infection – however, the pain was much easier to manage, and I was up and about pretty quick, I just had this bad flu for about a month. But I was just grateful to be walking on my own – after the first surgery I needed a lot of help standing and even used a wheelchair at the grocery store and stuff.